In all of the hustle and bustle of the holiday season, let Orion’s holiday wish list make shopping for your business simple this year! 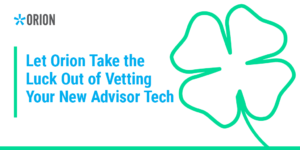 The post Let Orion Take the Luck Out of Vetting Your New Advisor Tech appeared first on Orion Advisor Services. It's Valentine's Day and we're playing Cupid. Let Orion help you show your client's how much you appreciate them this Valentine's Day with our list of tools to help your clients feel the love. The post 5 Tools to Help Your Clients Feel the Love this Valentine’s Day appeared first on Orion Advisor Services. 2018 Top 10 Orion Blog Countdown: Tech Conversion Tips, Breakaway Best Practices, Reporting Insights and More! Before the big countdown to midnight begins, let’s do a countdown of our own and see what the 10 most popular blogs were in 2018! The post 2018 Top 10 Orion Blog Countdown: Tech Conversion Tips, Breakaway Best Practices, Reporting Insights and More! appeared first on Orion Advisor Services. How you choose to build portfolios in Orion Eclipse will impact your tax-efficient trading processes and how the platform rebalances accounts. Learn how to make a decision in today’s post. The post Portfolios: The Foundation of Trading in Eclipse appeared first on Orion Advisor Services. Adding multiple weightings to a security to create multi-asset class securities in Orion Eclipse can help you take greater control over rebalancing and trading. Find out how! The post New Trading Feature: Multi-Asset Class Securities Now in Orion Eclipse appeared first on Orion Advisor Services. Sometimes, you need a more personal touch to use technology to its fullest potential. On day two of our most recent Eclipse + Communities Summit in Omaha, we dedicated the entire day to 1:1 meetings with our advisors. Here’s a behind the scenes look at what goes on during an Eclipse consulting session. The post Behind the Scenes: What’s Included in an Eclipse Consulting Session appeared first on Orion Advisor Services. Day one of our Eclipse + Communities Summit in Omaha covered a wide range of trading topics. Here’s what you need to know from our training sessions. The post Key Takeaways From the Eclipse + Communities Summit: Omaha appeared first on Orion Advisor Services. Choose from one of three training tacks at our Eclipse + Communities Summit in Omaha and get on your way to becoming a trading and tax-loss harvesting expert. The post 3 Reasons You’ll Want to Attend Orion’s Eclipse + Communities Summit appeared first on Orion Advisor Services. Offering model portfolios in Orion Communities can help you grow your business by adding an additional revenue stream as Subscribers sign up for the use of your models. Learn how in today's post. The post How to Build Portfolios in Orion Communities appeared first on Orion Advisor Services. With Orion Connect and Eclipse, your firm can utilize a completely integrated portfolio accounting and trading system that keeps your entire team in sync and saves valuable time when maintaining portfolios. The post The Advantage to Having Your Trading System as Part of Your Portfolio Accounting Platform appeared first on Orion Advisor Services.